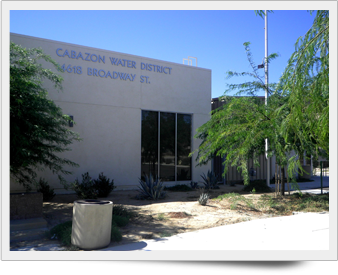 Welcome to the Cabazon Water District's official website. The District's Board has given the General Manager directions to develop an informative and entertaining portal on the World Wide Web. Our goal is not to only provide safe and reliable drinking water, but to achieve transparency with District finances and business matters as allowed by law. Your water district's Board members and Management hope you will find the website informative, enjoyable, and easy to navigate. You can now access your water service account and most records that fall under the Public Records Act, including meeting agendas, minutes, financial reports, and contracts. Other topics included on the site are water conservation ideas, water news, water quality, production, and emergency information. Our next FAC Board Meeting is scheduled to be held on Tuesday, May 21, at 5:00 pm. The Regular Board Meeting is scheduled for Tuesday, May 21, at 6:00 pm. Please note: we are only able to accept cash, checks and money orders for payments in the office. You can pay by credit or debit card online. Access current account information and bill history. Manage multiple properties in one place. Click below to log on to your account or to register a new account. For detailed instructions click here.